I lost a great friend this week. This friend had seen me through thick and thin - literally. No matter what size or shape I was in, this friend always loved me and wrapped me in it’s warm embrace. Always encouraged me with it’s fit and fabric. This week the GAP at the mall closed and I actually cried at the end. The memories are endless. I can still remember when we met. I was rushing to find an outfit to wear for the Easter service at church and even though we had never met, my friend wrapped me in it’s ever loving arms, found me an outfit, and paid me so many compliments that I left full of joy. That was also the night that I met my dear sweet friend Kristen who won my heart when she told me I looked like Sarah Jessica Parker. Kristen and the rest of the staff, so many of them my friends, would actually carry my babies around the store so that I could try things on. They would take care of Robyn, Zach and Finley so that I could have just a few minutes of peace and time alone. Time to look in the mirror and feel pretty, to put on brand new clothes, clothes that weren’t grabbed from a wrinkled pile, or stained by baby puke over the shoulder. 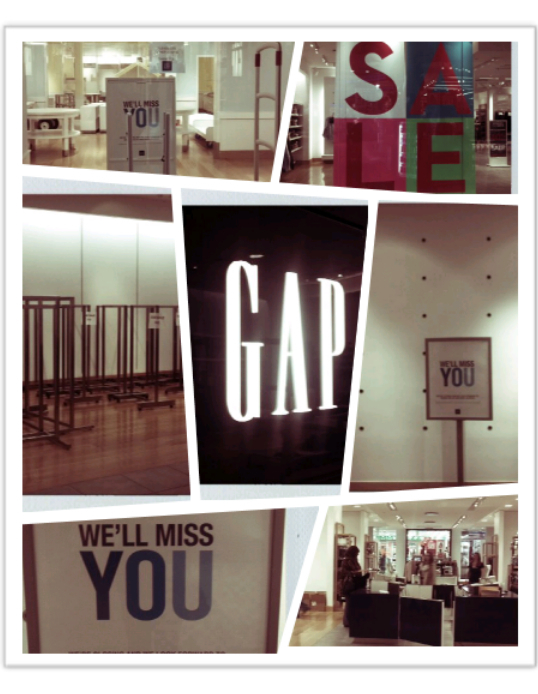 This GAP was always more than just a store to me. I loved the smell, the bright white walls, the lights, the fitting rooms, the mirrors, but most of all, the clothes. The way the shirts and sweaters were always neatly folded, stacked in perfect little columns, sizes in precise order. The pants and skirts hanging all in a row, like thoroughbred horses standing at attention. Scarves hanging, like a new box of crayons, one color blending perfectly to the next. The round tables with their displays, their assortment of colors that would smile at you as they drew you around the table to converse with each one. The scent, clean and fresh. When I would bring the clothes home, I admit to you that I would literally stand in my closet alone, holding them to my nose, inhaling the scent that filled me with delight. A smile on my face. My heart physically filling with joy. I loved my sweet friend. I mourn this terrible loss. I will not be able to pass that space in the mall without a heavy heart, and just out of sheer loyalty I will hate whatever store they fill it with. I would've cried too. My favorite. I feel the same way!!! I've been avoiding it since after Christmas because it looked so sad in there.